A diet consisting of a balance of protein, carbohydrate, good fats and fibre plus some fermented food for good bacteria and plenty to drink will provide you with all the nourishment you need to maintain a strong foundation for energy. Protein Protein forms the building blocks of the body and allows the body to repair itself. Protein should account for 15% of your total calorie intake, about 46g (women) and 56g (men) a day. Main sources should be skinless chicken and turkey, fish, eggs, and lean red meat. A small portion daily of cheese, live yoghurt and milk. Vegetable sources include nuts (almond, brazil, walnuts), seeds (pumpkin, sunflower, sesame), pulses (chickpeas, lentils, kidney beans). Carbohydrate Carbohydrate is the body’s main fuel and should make up 65% of our calorie intake. There are two types of carbohydrate: complex and simple. Eat complex whole grains which break down slowly for sustained energy and provide nutrients missing in simple (processed) carbohydrates. Eat 5-7 portions of a various fruit and vegetables. Limit simple carbohydrates (white pasta, bread and rice) which break down and act like simple sugar and dried fruits and fruit juices. Fats The body needs unsaturated fats for brain, nervous system and cell health and the production of hormones. These Omega 3 fats are found in oily fish such as mackerel, sardines, salmon, olives, avocado, flax seed, hemp seeds, nuts (particularly walnuts), seeds and good saturated fats in coconut and butter. Limit saturated fats in meat and avoid processed fats in margarine and trans fats in processed meals. Fibre Fibre helps the body absorb water and makes food bulkier helping it pass easily through the digestive tract. It also provides food for your microbiome. 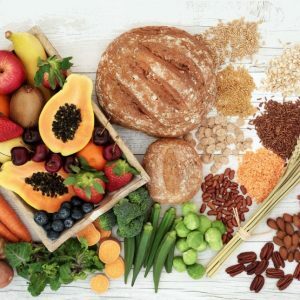 There are two types of fibre; soluble which is mostly found in fruit, oats and root vegetables and insoluble fibre found in wholegrains, nuts and seeds. Eat wholegrain cereals, seeds, pulses, fruit & vegetables including: oats, barley, rye, kidney beans, prunes, lentils, bran flakes, baked beans, peas, wholemeal bread, traditional porridge, apple with skin, brown rice, linseeds, cabbage, broccoli. Fermented food These contain a variety of good bacteria for gut health and some form should be eaten daily. This includes kefir (milk or milk alternative), sauerkraut, kimchi. Drink Drink two litres of water, tea (black, green, fruit and herbal) per day. Limit coffee to a maximum of two cups per day. Avoid sugary, caffeinated, fizzy drinks such as cola, Red Bull, energy drinks and artificially sweetened drinks such as diet drinks. Limit alcohol.